October 19th 1987 was a day of huge change for the global finance industry. On this day the options market crashed, the Nobel Prize winning Black-Scholes formula failed and volatility smiles were born, and on this day Elie Ayache began his career, on the trading floor of the French Futures and Options Exchange. Experts everywhere sought to find the cause of the crisis, and ways to avoid a recurrence in the future, but the one thing that struck Elie that day was the belief that what actually happened on 19th October 1987 is simply non reproducible outside 19th October 1987 - you cannot reduce it to a chain of causes and effects that can then be reproduced or prevented in a theoretical model. 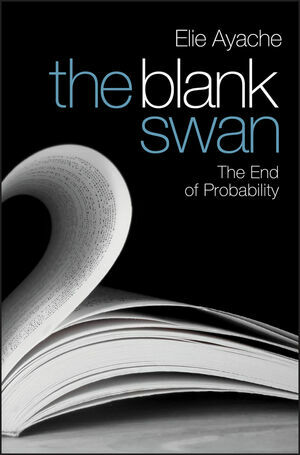 The Blank Swan is Elie's highly original treatise on the financial markets - presenting a totally revolutionary rethinking of derivative pricing and technology. It is not a diatribe against Nassim Taleb's The Black Swan, but criticises the whole background or framework of predictable and unpredictable events - white and black swans. In this revolutionary book, Elie redefines the components of the models needed to price and trade derivatives, and redefines the actual trading of derivatives and derivative pricing. Most importantly he redefines the market itself against the common perceptions of both orthodox financial theory and the sociology of finance. This book will change the way that we think about options and trade volatility and establishes the missing link between quantitative modelling and the reality of the market. Elie Ayache was born in Lebanon in 1966. Trained as an engineer at l’École Polytechnique of Paris, he pursued a career of option market-maker on the floor of MATIF (1987-1990) and LiFFE (1990-1995). He then turned to the philosophy of probability (DEA at la Sorbonne) and to derivative pricing, and co-founded of ITO 33, a financial software company, in 1999. Today, ITO 33 is the leading specialist in the pricing of convertible bonds, in the equity-to-credit problem, and more generally, in the calibration and recalibration of volatility surfaces. Elie has published many articles in the philosophy of contingent claims, as well as a book, dedicated to the philosophy of writing. PART I WRITING AND EVENT. 1 Writer of The BLANK Swan. 2 The Writing of Derivatives. 2.1 First Steps on the Surface. 3 The Event of the Market. 3.1 From States of the World to Market Prices. 3.3 The Critique of Derivative Pricing Theory. 3.4 The Necessity of Meta-Contextual Ascent. 4 Writing and the Market. PART II ABSOLUTE CONTINGENCY AND THE RETURN OF SPECULATION. 5 The Necessity of Contingency. 6 Passage to the Future. 6.1 From Possibility to Inexistence. 7 Necessity of the Future. 8.3 From the Market to Work. PART III FLIGHT TO SYDNEY, OR THE GENESIS OF THE BOOK. 9 The Mathematics of Price. 9.1 The Absolute without Thought. 9.2 The Absolute within Thought. 11.1 The Line of Flight. 11.2 The POINT of the World. 12 Out of the Box. 12.2 The Point of Return, the Point of Inversion. 2.3 How to be a Writer. 13.1 Finding the Market, Binding the Book. 14.1 The Field of Ruins. 14.2 Landing on the Market. PART IV CONVERSION OF CREDIT INTO EQUITY, OR THE GENESIS OF THE MARKET. 15 History of the Market. 16 From Debt to Equity. 16.1 Deduction of the Contingent Claim. 16.2 Deduction of the Exchange. 17 The Market and the Philosophy of Difference. 17.1 The Pit of Price. 17.2 The Market and Time. 17.3 The Market and Difference. 18 Future of the Market. 18.1 The Category of Price. 19 Appendix 1 The Logic and Mathematics of Regime Switching. A1.1 Description of the Regime-Switching Model. 20 Appendix 2 From 'Being and Time' to 'Being and Place' with Jeff Malpas.